Pour five hundred grams of Tony Hawk's Pro Skater into a bowl. Add a generous helping of Trials. Mix in two tablespoons of a roguelike (any will do), and then add a pinch, just a pinch, of Goat Simulator. Stir the mixture until it is thoroughly congealed, and then throw the bowl hard against a wall, ideally at around forty miles per hour. Pick out all the glass and anything else that's broken from the resulting splatter, and serve. That's the basic recipe for Descenders, at least so far. 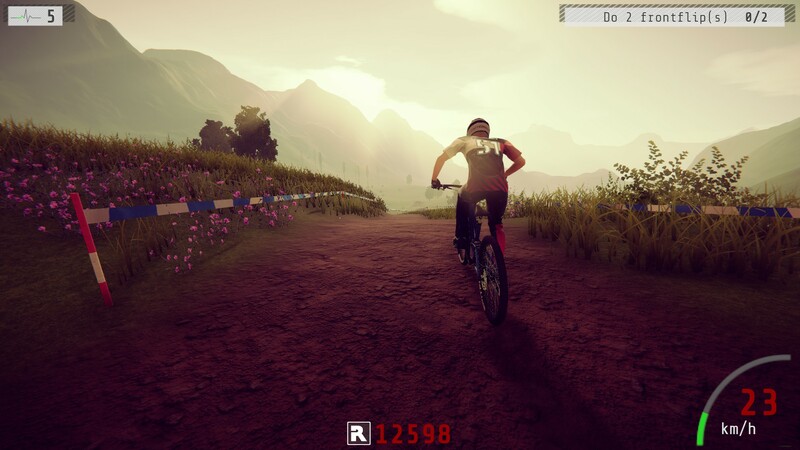 This equal parts tricky and silly mountain-biking ragdoll-'em-up launched in Early Access a couple of weeks ago, so who knows what else the developers will add by the time of its full release? A spoonful of Dirt Rally, perhaps? Or a sprig of Dark Souls? Everybody's putting Dark Souls in their games these days; it's the avocado of the virtual world. Maybe even the zest of Mario Kart - why not? Both games feature wheels, after all, chuck it in and see what it tastes like. I think this metaphor might have run away with me. The point which is rapidly fading into the distance is that Descenders at times feels like a grab-bag of influences, something that instantly reminds me of a bunch of other games but, while it pulls those inspirations together well enough, doesn't quite make them its own. It's an enjoyable enough game as it stands, but as yet it is not a sufficiently distinctive or definitive one. Let me try to explain. 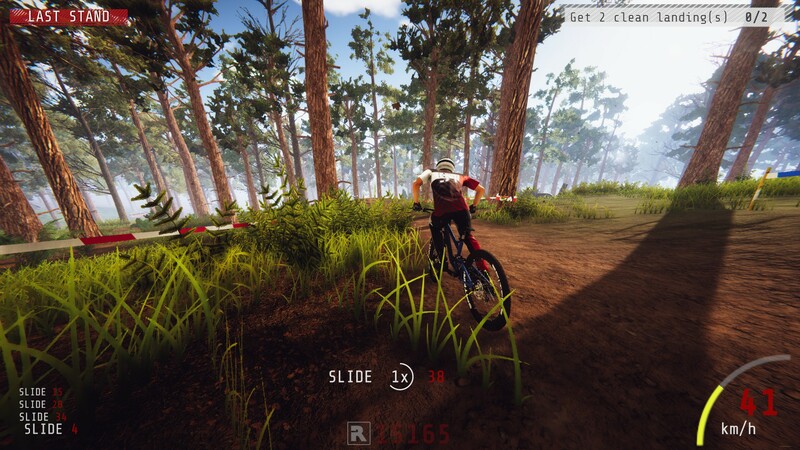 Descenders is a downhill mountain-biking game that straddles tricksy arcade-fun with a more physics-based simulation. 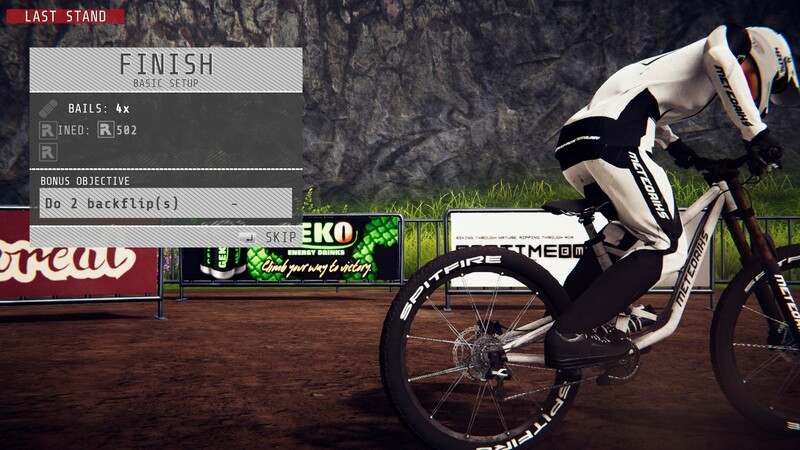 You play as a faceless mountain-biking chap who probably says words like “dude”, and “gnarly” a lot, whose goal is to progress along a sequence of downhill tracks, completing various objectives while trying to keep his skeleton inside his skin. Performing cool tricks and generally doing well earns you 'Rep', which unlocks various cosmetic items. Meanwhile, crashes and getting 'rekt' decreases your rep and eventually results in Game Over. 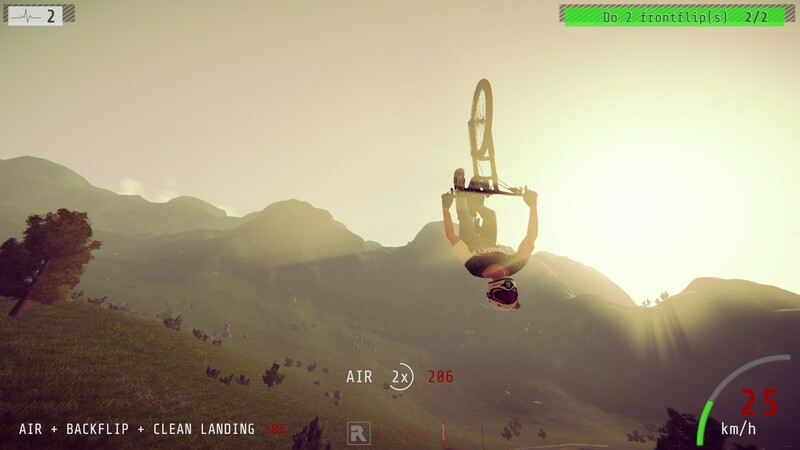 Controlling your bike at first seems impossible, as you need to control the acceleration of the bike as well as direction, while also bunny-hopping off ramps and manipulating the pitch of the bike to perform wheelies and other tricks. But it's surprising how quickly you learn to do back-flips and skid around bends, just like a young...um...I'm sorry, I don't know any famous mountain-bikers, so I'm just going to say “Max Whoaman”, because that sounds a bit like what a famous mountain-biker might be called. The game recommends using a pad, but I used the newly introduced keyboard controls without feeling too much like I was pedalling the bike with my hands, which is rare with these kinds of games. There are aspects to Descenders that I enjoyed a lot. Primarily, I like how open-ended it is when it comes to attacking its randomly-generated obstacle courses. There's no enforced requirement to take on the course put in front of you. It's perfectly viable to cycle around certain obstacles or even bypass the course entirely, in fact sometimes the game encourages this. One of the randomly assigned Bonus Objectives is to reach the finish line in under 35 seconds, which basically means ride through the grass as fast as you can. There are risks to doing this; the areas around the course are strewn with treacherous rocks half-hidden in the grass. Meanwhile, in later stages such as the Forest, although you can veer off course without penalty, doing so is inadvisable. The roguelike structure also has the potential to be brilliant, although right now it needs tweaking. Each stage has multiple courses to it that are represented on a map. When you complete a course, you can select one of three courses as your next challenge, all of which vary in terms of the amount of corners, the steepness of the slope, and the number of obstacles. Harder courses offer more opportunities to score big points, but you only have five lives to complete the entire stage, otherwise you have to start again. Hence you need to mediate the challenge across the entire course, saving up enough lives to tackle the formidable boss jump at the end of the stage. I like this idea of planning your broader run alongside making those moment-to-moment decisions on the course itself. Yet currently there's little incentive to tackle the harder courses apart from unlocking cosmetic items quicker. Furthermore, when you reach the next stage, you still lose all your progress if you run out of lives, and you can't start at the new stage until you've completed the boss jump from the previous stage three times. This jump gets progressively harder each time you overcome it, which means you're likely to spend a long time stuck on one stage despite having “progressed” to the next, which is frustrating and unnecessary. There are a couple of other issues too. While the over-the-shoulder camera angle looks cool, it's extremely unhelpful when judging your approach into corners and jumps. I've failed boss jumps multiple times simply because I couldn't tell which direction my bike was angled at before hitting the jump. 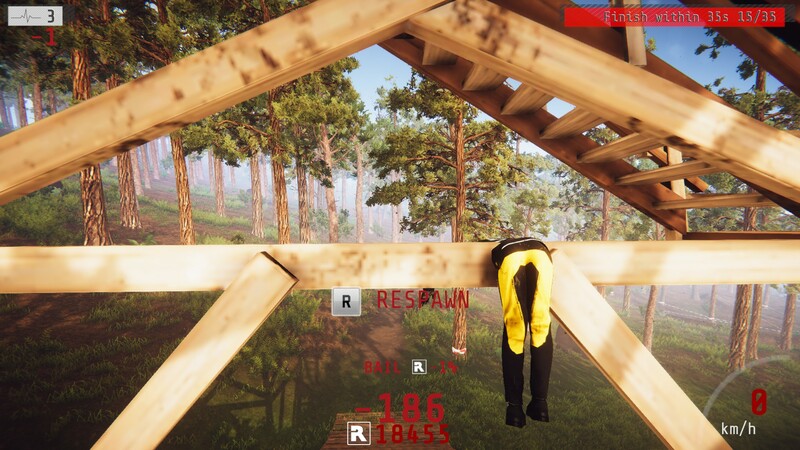 I get why the developer has positioned the camera so – it gives you a much stronger physical sense of rushing downhill, but if Descenders is intended to be a game about performing cool stunts and completing challenges, then it's highly impractical. This leads me on to my second point which I alluded to earlier on. I don't think Descenders itself knows what kind of game it is trying to be. It's positioned smack in the middle between the goofy escapades of Tony Hawk and Goat Simulator, and the more serious challenge of the Trials series. This isn't to say that it has to be one or the other, but occupying that centre ground is always difficult to pull off, and I don't think that Descenders has quite got the balance right yet. Descenders is certainly a game with potential, and I largely enjoyed the time I had in its company. What it needs now is some direction that goes beyond simply “downhill”, to better balance the different sides of its personality and tighten up some of its gears. 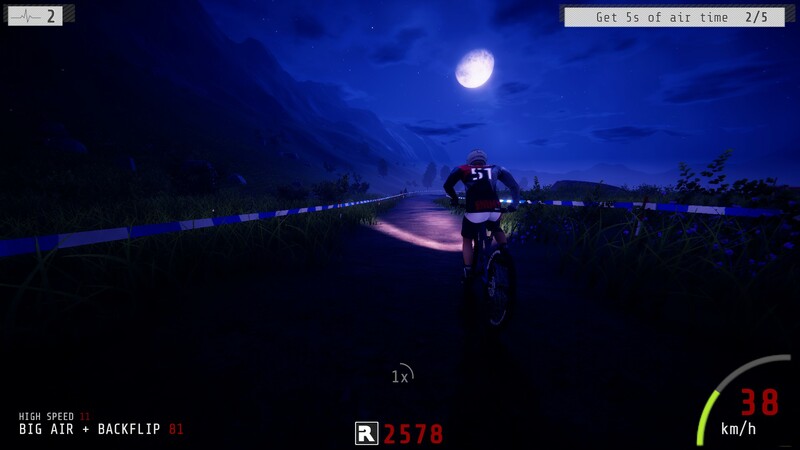 If you invest right now, I don't think you'll exactly regret it, but I also think there's a better game lurking amidst Descenders' forests which RageSquid is yet to arrive it.